I’ve spent too many days with cold toes to let it go on any longer. I bought some Wool-Ease Thick & Quick at the Arts and Crafts store, (although, they charge MSRP on the yarn there, a bit shocking for someone used to shopping sales in a multi-store-competition-based world) double-stranded it, and knit some of the ugliest slippers I have ever seen. You can find the pattern here, but I’m just gonna clue you in now that it’s a rectangle with cables on the sides and decreases in the last row. 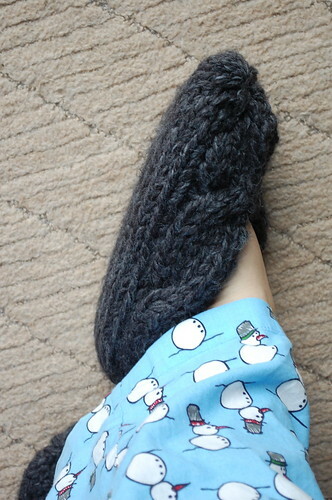 To be honest, double-stranding the Thick & Quick might have been overkill, but despite their thick and lumpy appearance, the slippers are cushy and warm. So, yeah – I’m not too enamored of the pattern, but it’s fast and functional. 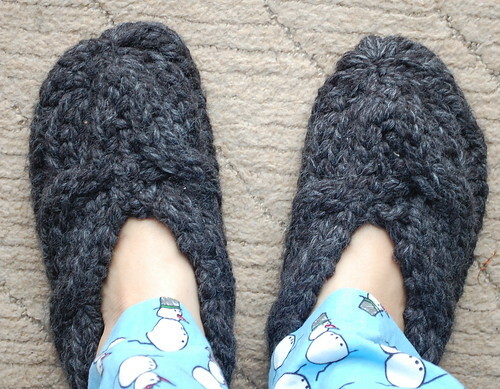 Max saw that I made some slippers and told me that he needed some, too – because he had cold toes. “You make me some, Mama!” You bet, bud. I ended up using about a skein and a half in my gigantic slippers, so there was plenty left to make some little single-stranded ones. (Pictures to come later.) Charlie might want some, too! We’ll see. This entry was posted in Finished, Helping Others, In Progress. Ooh they do look rather cushy! Nice solution for chilly toes. Holy Cow! I’ve been working on a baby afghan for a friend, but since all we have in our old apartment is a window unit A/C, it is way too hot and humid here in Texas to even hold the yarn. Ha ha, they are not ugly. They look really warm and comfy. I like the snowmen on your PJs. Oh, takes me back to when my Mom made those in all different colors and interspersed the colors. The ladies’ always had pom-poms on top. I wish I had them now. Thanks, Mom – I love and miss you.